V of 3 Starving Artist! The Festivities don't end at 6 like most festivals, we are STILL going!! Join us around the bon fire starting at 7:30 for Kira and V to bring us into a drumming circle to rock all drumming circles!! Kira Lang, of Cross Cultural Dance Company who you have seen at Atlanta Pagan Pride and the Pagan Pathways Festival along with the very talented V of 3 Starving Artist , will be performing and leading us into our end of the day drum circle. 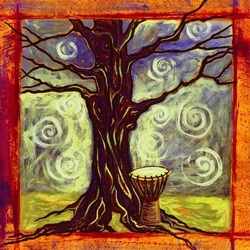 Come watch Kira dance to the drumming of V, then join with them in dancing and drumming. Bring your drums, zills, rain sticks, voices, and dancing shoes, and join Kira and V in a drumming celebration you won't soon forget! !